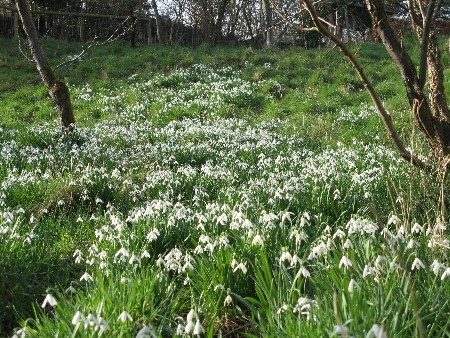 In gentle South Devon, warmed by the Gulf Stream, we rarely feel the biting cold of morning frost. This year has been, oh, so different. Novembers’ relentless rain drenched our souls. December ice and snow found us skating on frozen farmyard, collecting water for thirsty animals, bucket by bucket, from the stream, the only source of unfrozen water. January brought swinging north winds, hail and sparkling, spectacular heavy frosts and now February rains again. The ground has been frozen for weeks, now we slip and slide on mud, no grass is growing yet. Tractors travel back and forth collecting big bales of haylage to keep hunger at bay. 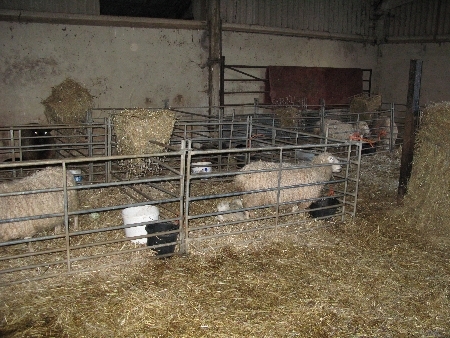 Ewes come down to the yard at night for tea and night time shelter; lambs are born thick and fast. Each new mother is penned up with her offspring in the dry until babies are seen to be thriving and feeding well. The ladies in waiting huddle into another shed sheltering from the elements, awaiting admittance to the maternity wing. Wethers and last year’s ewe lambs nibble at what they can find on adjoining top fields. As they hear the tractor each afternoon they race to their respective gates waiting anxiously for tea, pushing and shoving to get to the hay and the trough first. Unlike commercial breeds Whiteface Dartmoor’s mature slowly so may stay with us for up to a year before being sold either for breeding or meat. A New Beginning……………….. from Paul Vincent on Vimeo. Just three donkeys now glean what they can by stretching necks over fences for a little sweet delicacy here and there of bramble or ivy, thus supplementing a manger of hayledge and the breakfast and tea served daily in their stable. Thick coats keep them warm but, unlike horses, they have no oil in their coats to keep them dry so must always come in when the rain lashes across the valley. Time now between visits to the farmyard to catch up on all the inside jobs so tedious when the sun shines; mend the leaking ceiling in a shed, make plans for the garden, plant seeds, redecorate a bedroom, clear desks and file all those papers, tidy cupboards, take a trip to the recycling depot! And try, oh try to sit now and then by the fire and read. It’s time, too, to use up all the food harvested from garden and farm in the summer: a big heart warming Cottage Pie perhaps. 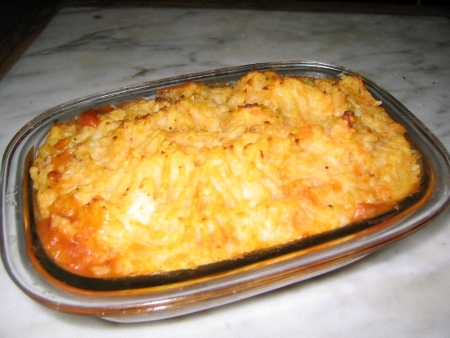 Traditionally Cottage Pie and Shepherds Pie were made from the leftovers of the Sunday roast. The cold meat was chopped up, mixed with the leftover gravy, put in a pie dish and topped with mashed potato and reheated in the oven. It was OK but a bit dull! 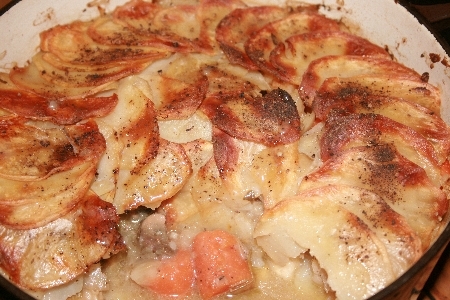 But made with fresh minced beef or lamb it is quite delicious and so simple to make too. Chop a large onion and three cloves of garlic. Soften over a low heat in a little oil. Raise the heat; add 500gm of minced beef or lamb and stir till nicely browned. Sprinkle with 1 tablespoon of flour, stir and add 300 ml stock, homemade or made from a cube, plus 150ml wine, and a large tablespoon of tomato puree. Stir again. Add salt and pepper, cover the pan and simmer gently for 25-30 minutes. Meanwhile boil 1kg of potatoes in their skin, drain, cool and peel. Return to the pan and add 75gms of butter and a about 200-300ml hot milk. Mash lightly. Cold milk and overworking will produce wallpaper paste! We have two hogs coming back from the butcher on Monday so my mind drifts back to old cookery books. Mutton is not on the menu very often now and has definitely fallen from grace until a very recent revival. I think of mutton chops and Lancashire Hotpot. How the methods vary. Dorothy Hartley in her wonderful “Food of England” flours and browns her mutton chops before standing then on end in an earthenware pot. She packs in an onion per chop, large pieces of carrot, then “some oysters”. Next she covers the lot with sliced potato overlapping like “tiles on the roof” She makes a thick, and to my taste, rather heavy, old fashioned gravy with flour, boiling water and the fat from the fried meat. To this she adds salt, pepper and, she insists, a sprinkling of sugar. Most important, she says, no, no, I say! Then in goes a dash of Yorkshire relish or anchovy essence. All this is poured over the meat and vegetables and the whole is covered with a lid and baked “with a good fire” for two hours. Mrs Beeton fries nothing but simply layers meat and vegetables in a fire-proof baking dish, no oysters here, just water, salt and pepper. The lid is removed twenty minutes before the end of cooking to crisp the potatoes. Constance Spry favours the oysters, mushrooms and a good stock. She covers the pot with grease proof paper instead of a lid removing it some twenty minutes before the end of cooking to crisp and brown the potatoes. I must say I favour these to versions above Mrs Hartley but I suspect a tour of Lancashire itself would bring as many, maybe more, variations. So I’ll steer a course through the middle, probably leaving out the oysters and cooking everything a day in advance, cooling overnight and removing the fat from the top before reheating. I was amused to discover no mention, of course, of such a dish from Elizabeth David. Her mission was to encourage us to look beyond our shores. 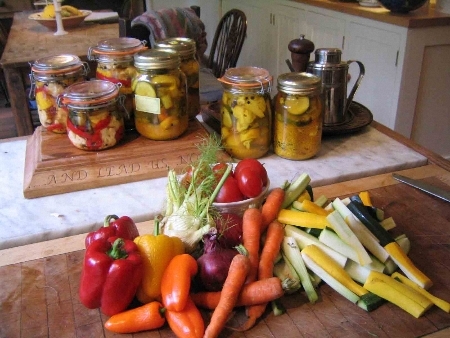 Pickles and Vegetables just waiting………………..
Out of the deepfreeze comes a shoulder of lamb which I boned and rolled a while back. To bone any meat use a sharp flexible bladed knife and, sliding it into the meat, work your way along and around the bones. Blunt knives are much more dangerous than sharp ones because you need so much more pressure, then you slip and cut yourself! Sprinkle the meat with course salt and freshly ground pepper. Herbs are always a welcome addition to the pan. This time I have the prunings of the Thyme plants from the garden and I will roast the lamb on a thick bed of these thymey twigs. Rosemary and garlic are also particularly delicious with lamb and later in the year a bed of mint permeates the meat as it cooks and smells of spring. But beware sage, it’s too strong for lamb and belongs with pork. This piece weighs some 3lbs (about1.5 kg) so it will feed us for a couple of days, hot and cold. Hot : Roast in a hot oven 20 mins to the lb (45 per kg). Blanch peeled potatoes for 2-3 mins, drain, then roast round the meat. We will have red and yellow stemmed chard from the polytunnel and Puy lentils with garlic and ginger to accompany the meat. And gravy of course; it surprises me how often I am asked how to make gravy without those disgusting gravy granules! Lift the meat from the roasting pan when it’s cooked and put it to “rest” on a serving plate or board, cover and keep warm. This will make it easier to carve and give you time to finish every thing else. Drain the spinach chard or other vegetable and keep the water. Return the roasting tin to the heat, scrape the residue with a wooden spoon and gradually stir in some of the veg water. Simmer, then stir in a teaspoon of corn flour mixed to a thin paste with a little water. As the gravy heats it will loose the cloudy look and become glossy and a rich brown. Adjust thickness to your taste with a little more stock or corn flour mixture, if necessary. Add salt and pepper to taste. Next day we will add baked potatoes with crème fraiche to the cold lamb. A rocket salad once more gleaned from the remains in the pollytunnel will be sprinkled with course salt and virgin olive oil, and maybe a dash of fig balsamic vinegar. Or perhaps I‘ll make some mayonnaise instead. Home made plum chutney will finish things off and of course a glass of wine. Now for real comfort eating while we wait for spring! Old English Boiled Beef and Carrots, Italian Minestrone, Welsh Cawl, Suffolk Stew, and then there’s Garbure. 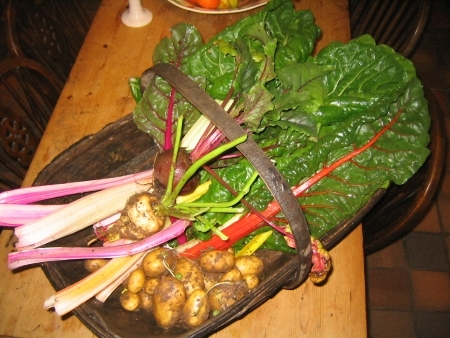 Somehow this last wonderful pot of South West France brings so many regional dishes together. And as an English woman all be it with a tiny amount of French ancestry, who am I to say how it should be cooked! Well bravely, here’s my Anglicised version! To begin: soak 500gms of dry white beans overnight. Make a good rich stock with a chicken or duck carcass in the usual way. Drain and rinse the soaked beans and bring to the boil in a heavy pan. Boil briskly for ten minutes, rinse and drain again. Blanch a 500gm piece of belly of pork. Next put the pork belly, a ham hock, an onion stuck with cloves and the blanched beans into the strained stock. Simmer for about an hour. Add a couple of diced potatoes, 2 leeks, a turnip, a few carrots, green or red pepper, cut in strips, salt, pepper, crushed garlic, a little paprika, dried herbs. Simmer until the vegetables are nearly cooked. Add a shredded white cabbage, 500gms of garlic sausage and most importantly, confit of duck. Opinion varies as to whether or not the duck fat is added too. It’s a matter of taste, a little will enrich the whole, I think. Warm the Garbure through. Just before serving take the meat from the pot and keep warm. Serve the broth on thick slices of bread as a first course and follow with the meat. As I look through old cookery books I remember why so many people wrinkle their noses in distaste at the mere mention of beetroot despite its recent media renaissance. Remember those insipid pinkish, soggy, malt vinegar soaked balls trapped in plastic or bleeding into fierce salad cream? But it doesn’t have to be like that. Think of a big bowl of fresh Borsch made with a really good home made stock, grated raw beetroot, shallots, tomatoes, a potatoe or two and a sliced courgette, all cooked quickly and served bright and glistening with sour cream and chopped spring onions. Beetroot is wonderful hot too, baked in its skin in the oven like a potato and served with marmalade…yes really!….or warm in a salad of apple, goat’s cheese and walnuts with a rich green virgin olive oil. 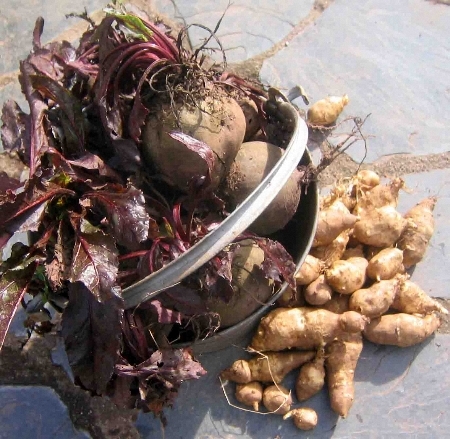 I love Jerusalem Artichokes too and as always I had bumper crop. Though as my old nanny said to my horrified and terrifyingly austere grandmother all those years ago “no thank you, madam, rather windy things….” She was right of course, a little go a long way. Nevertheless I shall make soups. I’ll fry crispy artichoke chips and “stove” some too cooking them in butter and olive oil, oh so slowly in a sauté pan on the top of the cooker with a few sliced potatoes. They’ll be topped with parmesan or, better still, served with a Béarnaise sauce, delicious with grilled meat. I will roast some in the oven round a leg of lamb or a piece of beef. But whatever I plan to do with them, first they will be carefully peeled before cooking and plunged into acidulated water to stop them turning grey which they do almost immediately their peel is removed. 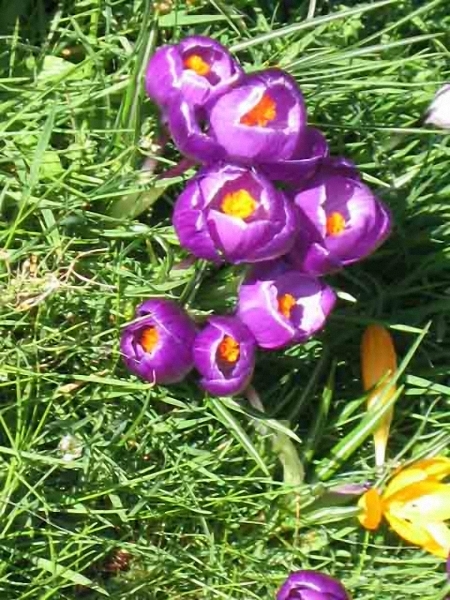 Oh, and just a very few will go back into the soil for next year and grace the garden with their sunny, yellow autumn flowers. One of the most versatile and handsome vegetables standing majestically in my vegetable garden this winter is the Italian cabbage, Cavolo Nero. It’s thin, long dark green leaves are the essential part of Ribollita, the famous Tuscan bean and cabbage soup, made a day in advance and “re-boiled”. Yesterday’s minestrone! Walking back from the farmyard to the house today, I picked a hand full of leaves and pulled up a leek. With the addition of a couple of carrots and potatoes, a parsnip, shallot, a tin of haricot beans and a tin of tomatoes, and a handful of scraps of ham will have a thick and delicious soup for supper. Ribollita tomorrow! Bon appetite soon it will be Spring! I grew my plants from seed for the first time last year. I planted them out in blocks where they now stand like little green palms in the bare earth. The narrow green leaves can be snapped off the plant encouraging new growth. Tiny new leaves are wonderful in winter salad with the variegated chicory, radicchio sotto marina, mizuma, and land cress all over wintering in the poly tunnel. Cavolo Nero can be braised with garlic and ham and become a meal in itself. My favourite way to use it, though, is with rich garlicky flageolet beans. Rinse the dried beans and then soak for 30 minutes. Bring to a fast boil for 15 minutes. It‘s important to pre boil all dried beans because some contain toxins and the best rule of thumb is pre boil them all! Now drain them, rinse again and simmer gently for about an hour. Do not salt the water; this toughens the skins of the beans. You can of course simply open a tin of flageolet beans! Put the cooked beans in a pan with a dash of olive oil, a crushed clove of garlic and a teaspoon of dried herbs. Leave to infuse. Strip the tough storks from the cabbage leaves and blanch for a couple of minutes in boiling water. Drain thoroughly and stir into the beans. Warm through gently. Serve with any grilled meat, roast shoulder of lamb ( see recipes for cooking lamb) or braised sausages with gravy and mashed potato for a comforting meal on a cold winters evening.